It was quite a collection I had, it included an X-Wing, B-Wing, Tie Fighter, Scout Walker, ATAT, Millennium Falcon, not to mention over a hundred figures and other highly sought after items. 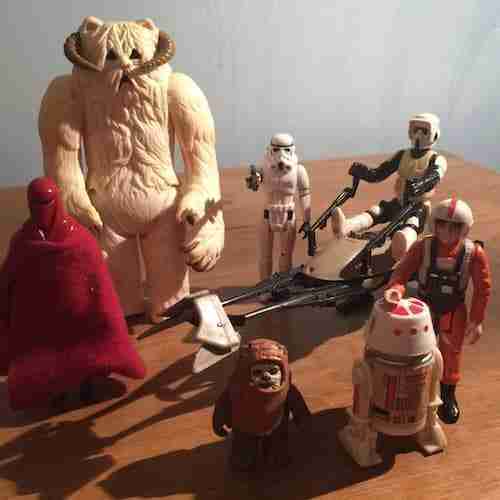 My sale proved to be expertly timed with the combination of Christmas and the hotly anticipated ‘The Force Awakens’ only weeks away from release making my eBay account more attractive than Princess Leia in her gold bikini. Unfortunately I didnt have original boxes and none of my items were in unused mint condition which meant 100’s not 1000’s of pounds, but even still I cleaned up, with my most startling sale being £25 for a 2cm x 5cm piece of perspex, aka an X Wing cockpit canopy, madness! Ebay was my new best friend, nothing was safe, you got to close and Id sell you faster than you could say “utini” to a passing Jawa. By the time the deadline for my final instalment arrived, Dec 14th, I was able to pay the majority of the balance without the use of my already heavily burdened credit card. Things were looking up. I still didnt have a job, but my money was under control and to lift my spirits further I was informed by my GP that I had an easily curable condition, vitamin D deficiency, or as I like to put it a severe Australia deficiency. As it turns out the lack of Vitamin D in my system was the main reason I was exhausted all the time and unable to train, furthermore low Vitamin D levels can play a significant role in accentuating the symptoms of depression, and therefore this diagnosis was a momentous discovery.